It is only recently that I began to wonder if Simple Green really is as ecologically friendly and safe as the name of this cleaning product implies. Carcinogens: No ingredients are listed by OSHA, IARC, or NTP as known or suspected carcinogens. Volatile Organic Compounds (VOCs): Cleaner meets CARB & BAAQMD regulations. Cleaner must be diluted 1:1 with water to Meet SCAQMD Rule 1171 & Rule 1122 VOC requirements for solvent cleaning operations. This material contains 2-Butoxyethanol, < 4%, (CAS# 111-76-2) which is subject to the reporting requirements of Section 313 of SARA Title III and 49 CFR Part 373. 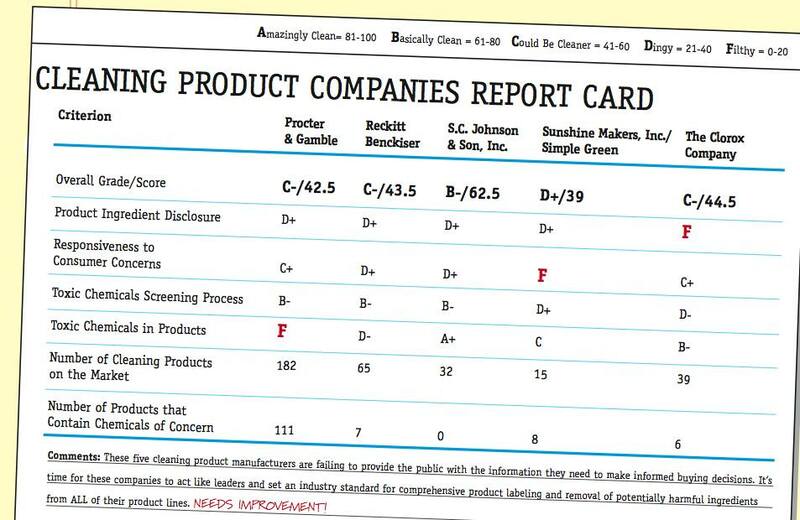 The Dirt on Cleaning Chemical Companies report card about Sunshine Makers Inc./ Simple Green was that their product ingredient disclosure received a D+; their responsiveness to consumer concerns received an F; their toxic chemicals screening process received a D+; the toxic chemicals in their products received a C; the number of cleaning products on the market was 15; and the number of products that contain chemicals of concern were eight. The chemical of biggest concern cited by WVE is 2-butoxyethanol. 2-butoxyethanol is found in many household cleaning products, but without required full disclosure, consumers often don’t they are being exposed to it. At least Simple Green admits it is in their product on the MSDS; however, this chemical is known to cause birth defects, fertility issues, nose and eye irritation, headaches, and vomiting. 2-butoxyethanol is easily absorbed through the skin, which is the leading pathway for exposure. It is not listed on the EPA’s list of hazardous air pollutants, but California and Canada list it as toxic. William Nazaroff, a professor of environmental engineering and chairman of the Energy and Resources Group at UC Berkeley, has argued that EGBE should have remained on the federal contaminants list, and concluded in a study that the use of some common household cleaning products containing EGBE could expose people to levels 12 times greater than California’s one-hour guideline, especially when indoor use is considered. These products are not required to list it on the label when diluted to a certain point. This does not sound like a chemical that belongs in a green cleaner to me. I rarely wear rubber gloves when cleaning, and I certainly don’t want 2-Butoxyethanol entering my body. I would never let my children help me clean with such a chemically ladened product. I feel like I have been simply greenwashed by Simple Green. Well Poo! I’ve enjoyed using Simple Green over the years because it was a) concentrated (loved the reduced packaging aspect) b) really seemed to work well as an all-purpose cleaner and c) the fact that it was relatively unscented and not full of all the scents/essential that so many other “natural” cleaners so often use. Anyone got any suggestions for something that also meets all three of those criteria?????????????? For concentrate that cleans really tough stuff, I use citra-solv, but I haven’t done all the research on it to see how safe it is. It does have an orange smell. I am the Environmental & Regulatory Coordinator for Simple Green. If there are any concerns with any of our products I’d be more than happy to discuss them with you. In the meantime I’d like to address a couple of your concerns. Simple Green was created in 1975 as a safer alternative to industrial cleaning chemicals. It was named Simple Green because its green color made it simple to dilute out to the various cleaning strengths you can use. Being brought into the industrial workplace, the formula had to undergo government required testing by The Occupational Safety and Health Administration (OSHA) to determine any hazards and ensure workers safety. All claims you see on the bottle are verified through testing. The product is indeed non-toxic, biodegradable, not a mutagen, carcinogen, reproductive toxin, sensitizer and so forth. I’d be more than happy to share any of this test data with you if you’d like. Permissible Exposure Limit (PEL) established by the Occupational Safety and Health Administration (OSHA) is for air contaminants on the amount or concentration of a substance in the air. Air contaminants include gas, dust, mist, and vapor, and anything not typical of our breathing atmosphere. Excess of an ingredient in our atmosphere, such as too much oxygen, could also be considered a contaminant. OSHA currently has around 500 PELs for various chemical substances, many of which are widely used in industrial settings. This list also includes sucrose (the sugar in your kitchen), ethanol (alcohol you drink and showing up more and more in cleaning products) and acetic acid (vinegar). Logically everything has an exposure limit, but OSHA looks at what industrial workers are most commonly exposed to so that it can try and keep them safe. The quoted amount is for undiluted 2-butoxyethanol, which exposure can be reached within an 8 hour period at say a chemical manufacturing plant. It is very unlikely that at a 4% solution, anyone would ever reach the PEL of 2-butoxyethanol. However, if there was a situation where someone exposed themselves to thousands of gallons of Simple Green for an entire workday, this information is available for their safety. Essentially non-toxic means that while the product is not lethal or corrosive it can still cause an adverse reaction in the form of an upset stomach or even diarrhea if a large amount is consumed. We can all agree that while we like vinegar in our salad dressing, we would not be feeling too well if we drank a glass of it in one sitting. VOC’s, for a very simple explanation, are ingredients that evaporate at room temperature and contain a carbon molecule. This also includes ingredients such as ethanol and acetic acid, as well as all candles, incense and essential oils and fragrances. While food products are not regulated for their VOCs, those ingredients utilized in cleaning products are. VOC regulations are strictest in California, in particular South Coast. This is due to the heavily populated and industrialized areas. Vinegar, which is 8-15% acetic acid, if sold as a cleaning product in California as is would be out of compliance. VOC’s must also be reported to the air quality board by industry. This is how air quality is regulated and monitored. Disclosing this information is vital to ensure that companies do not exceed their VOC limits. Sometimes these companies are unaware of what ingredients are VOCs, and so we inform them of their required reporting requirements by the SARA 313 statements. The concern voiced by WVE was not for the oral toxicity of 2-butoxyethanol but for the fact that there are glycol ethers that have exhibited fertility issues. The two glycol ethers of concern are not 2-butoxyethanol. 2-butoxyethanol is not known to cause birth defects in humans. It has been seen in some tests to cause that in rats, however just because that has been seen does not validate that it is known to cause that. That’s the same as saying peanuts have been seen to be toxic to humans, therefore peanuts must be toxic to humans. If that is the concern you have for 2-butoxyethanol, then you must apply that concern equally to all chemicals or substances. 2-butoxyethanol is also considered toxic in its full strength form by California. You can see it in their hazardous substances list (http://www.dir.ca.gov/title8/339.html) however it is not considered a toxic air pollutant (http://www.arb.ca.gov/toxics/id/taclist.htm). Those are two completely different things. For another example, the vinegar you suggest to make glass cleaners out of is composed of acetic acid. Acetic acid is highly corrosive and dangerous. It is a corrosive gas in concentrations of 25%. It has been witnessed to cause lung disease in workers exposed to it for long periods of time. Why then is vinegar not scrutinized for its one hazardous ingredient? My point is that everything is a chemical, and you cannot assess the hazard of a product based on a single ingredient. If that’s the case you should stop eating any and all food due to its preservatives. Or anything that contains salt, as the oral toxicity value is set at 3 grams per kilogram body weight. In fact, a 4 year old boy has been suspected of murder by salt poisoning of as small as 4 teaspoons worth. I apologize for how long this comment became. I’d be more than happy to continue discuss any of your concerns with Simple Green and the legal regulations around these products. Why not just revise the formula more like a real green product like- METHOD and take that controversial ingredient out every one is worried about?? This is still a lot of Corporate jargon, and in no way convincing of the safety of the product. To use the peanut analogy is just ridiculous… yes, some people have allergies/sensitivities to any nut, something arranged by nature. But this is a product with a toxic substance NOT created by nature, and if is has been *shown* to be toxic to any creature (rats included), then some eyebrows must be raised and concerns voiced. To brush it off as probably not toxic to all people all the time is outlandish. To also bash vinegar, salt, or any other natural substance is just a weak attempt at pointing the finger elsewhere and not providing solid evidence evidence that Simple Green is a 100% safe product. And when does the common person cleaning their home EVER use vinegar in a concentration of 25%?? Please. Also, to say you should stop eating any and all food because of its preservatives is outlandish! Have you ever consumed or even heard of organic raw fruits, vegetables, nuts, seeds, etc.? I am a former user of Simple Green, and this post has convinced me that I made the right decision to ask questions and cease usage of something “potentially safe,” which equates to “potentially harmful.” Thank you. I am the Environmental & Regulatory Coordinator for Simple Green. I’m a bit disheartened at the deletion of my prior comment. I’d like to repost it again. My intent is to actually educate the public on the science and regulations involved with chemicals. This allows anyone to make form their own opinions based on knowledge and facts, not single ingredient fear tactics. To begin, Simple Green was created in 1975 as a safer alternative to industrial cleaning chemicals. It was named Simple Green because its green color made it simple to dilute out to the various cleaning strengths you can use, nothing more. This was at a time before the green movement after all. Introduction to the industrial workplace required testing from the Occupational Safety and health Administration (OSHA) to determine the product hazards and ensure workers safety. This one-time testing verified the safety of the product. All claims made are backed up by data, and I’d be more than happy to share any of this information with you. Permissible Exposure Limits (PELs) are established by OSHA for air contaminants – gas, dust, mist, vapor, even excess oxygen or nitrogen. OSHA currently has around 500 PELs for chemical substances, many of which are widely used in industrial settings. This list also includes sucrose (the sugar in your kitchen), ethanol (exposed to you through any alcohol you drink and being more and more utilized as a green cleaning ingredient) and acetic acid (8-15% of vinegar). Logically everything has an exposure limit, but OSHA looks at what industrial workers are most commonly exposed to so that it can try and keep them safe. Pure 2-butoxyethanol has an exposure limit. This is to ensure workers safety in chemical manufacturing plants. We include this information just in case, though highly doubtful, someone decides to expose themselves to hundreds of gallons of Simple Green as they could theoretically reach the exposure limit. Essentially non-toxic means that while a product is not lethal through ingestion, if enough is consumed you may still experience an adverse reaction like nausea and an upset stomach. We can all agree that if someone drank a glass of vinegar, they too would have the same experience. VOCs, simply defined, are chemicals that evaporate at room temperature and also contain a carbon molecule. This includes ethanol, acetic acid, anything with a fragrance, essential oils, and so forth. California has the most restrictive VOC regulations given the population and industrialization of our state. Southern California is even stricter than the state. VOC regulations are how Air Resource Boards are able to monitor and attempt to regulate and clean up our air. For example, if I was to take my vinegar and use it straight to clean anything I would be legally out of compliance with California’s VOC regulations as 8% would be double the current limit. While food products are not regulated for their VOCs, this is to show that VOCs are everywhere – even naturally occurring. Given that VOCs are regulated for many categories including cleaning products, and to be helpful to consumers, we inform them of their reporting requirements via SARA 313. WVE concern with 2-butoxyethanol is that it is within the glycol ether family and there are two other glycol ethers known to cause birth defects and fertility issues. 2-butoxyethanol is NOT known to cause these and has never been seen causing this in humans. At insanely high oral dosages, it has been seen in a few laboratory tests on rats and nothing more. It is not a Hazardous Air Pollutant as defined by the EPA, and it is not a Toxic Air Contaminant as defined by California and Canada. It is a hazardous substance, but so is ethanol and acetic acid in their pure forms. The product is toxic in its pure form, but then again so is salt. It is very true that a four year old boy died through forced consumption of what is calculated to be seven teaspoons of salt. Acetic Acid in concentrations of 25% or more is highly corrosive as a gas let alone a liquid and seen to cause lung disease in workers. My point is that everything is a chemical, including water. Everything is toxic at the right dose, to the right organism at the right life stage. This all or nothing approach, while illogical, is also not being consistent. If you choose to avoid Simple Green because of your fears of 2-butoxyethanol, then you should also avoid vinegar because of the hazards of acetic acid or cleaners that are 90% d-limonene which are combustible, a pure VOC and has been seen in extreme laboratory testing to transform into formaldehyde through ozone oxidation. I thank you for your time, once again, and hope that you will consider further educating the public on chemicals and the science and legislation behind them. I’d be more than happy to further discuss this and any other issues with you. Me and my daughter both have asthma. Anytime someone uses simple green near us we cough and become short of breath. What could cause this ?? I liked Simple Green. I’m sad that we can’t use it. Laura, your previous comment was not deleted. All first time comments are moderated to prevent spam. I have been out of town and unable to moderate until this evening. I’m very sorry for rushing to that judgement, it was an oversight on my part. If there is anything further I can help expand on when it comes to the science and regulations behind ingredients, I’d be more than happy to help. There is no way vinegar is even in the same league as 2-butoxyethanol. Acetic acid (which is NOT the exact same thing as vinegar) is only considered corrosive at 25% or more concentration. According to wikipedia “Dilute acetic acid, in the form of vinegar, is harmless.” Way to try to spin that it is just as dangerous and play on fears. I will be tossing out my Simple Green. I will be keeping my vinegar. I’m sorry; I don’t think I got my point across correctly. I’m not attempting to scare people of vinegar, far from it. It’s all too often that someone is told ingredient x has regulation y and people get scared without realizing that everything has a regulation y. It’s an attempt to educate the public on the bigger picture that is science, chemistry and the regulatory world. If you agree that dilute acetic acid (8-15%, or at least under 25%) is safe. Then that line of logic has to apply EQUALLY to all chemicals. Depending on the chemical, it too can reach a level of being considered safe. Perhaps 24% acetic acid is “safe” (I would consider it 15% or less honestly) and 24% EGBE is not. But testing has verified that 7% or less EGBE is safe as well. If that seems to run true for everything else, it should also run true for EGBE. 100% 2-butoxyethanol = dangerous, I don’t deny that. 4% is not equivalent to 100%. If you choose to believe that no matter how much you dilute 2-butoxyethanol it will never be safe, then that logic should apply equally to all chemicals as well otherwise you are not being consistent with your reasoning. There is a point in the examples you’ve given, but you cannot make a blanket statement that it equally applies to ALL. Not all chemicals are equal. The new legislation and outcry about even small abouts of lead, phthalates & BPA in children’s items proves the point that even a small amount is harmful. A drop of hydrochloric acid will still burn you. You can’t use the same logic for all chemicals because they are not all the same. That’s the argument all the chemical and plastics companies have been making and it’s just not holding up. How about $3,000,000 of independent testing and 30+ years of use in the consumer and industrial market without long or short term consequences when used daily. Does that count for anything? I’ve seen Simple Green’s test data, which is what no one seems to want to check out, and the company has over 30 years of use in the workplace, military and households with no long or short term consequnces. The only reason that it has so strongly been dragged into the limelight is because there are other companies that would like the business that Simple Green has spent the last 30 + years establishing. If people want to stop using a product that has a 30+ year established safety record, and replace that with products that are potentially carcinogenic, and simply have better marketing and dishonest, misleading CEO’s that need to drag other companies through the mud while producing something that doesn’t even live up to thier standards, then so be it. Buy something else. I will continue to use the product that my family has been using for the past 15 years which is Simple Green. None of us has any health issues, we reproduce just fine and all but one of us were honor roll students that have grown to be very healthy and successful adults with childred of our own. You do bring up a good point – All chemicals are not the same, however I’m not attempting to make this a blanket statement for all chemicals, only 2-butoxyethanol and the concerns around it. Your examples are chemicals that are endocrine disruptors and mimics -a category of behavior that 2-butoxyethanol does not fall underneath. With Bisphenol A (BPA) and phthalates, we are now talking about endocrine disruptors. To keep it simple, the endocrine system detects hormones. Hormones are composed mainly of (but not solely of) benzenes and phenols. Benzene is a six carbon ring with three double bonds. Phenol is a six carbon ring with an attached –OH (alcohol: oxygen & hydrogen) group. Bisphenol A (BPA), obviously by the name contains a phenol, which means that it can mimic normal hormones once ingested. Phthalates contain a benzene ring. They too mimic normal hormones once ingested. Now there is nothing wrong with benzene’s or phenols in and of themselves, since a normal healthy body will produce these compounds for regular function. Even pure essential oils will have a small amount of phenol components to them, phenols are one type of chemical that gives off a scent. It is the excess that we are exposed to that causes the problems, in particular to fetuses and children who rely more heavily on hormones for normal growth and development. Lead is a chemical that can mimic calcium. Calcium has many important roles in human body functions and it also the building block of other chemical compounds to help us function normally. So if lead can mimic calcium, it is able to enter those pathways of normal function and thus cause the harm that it does. Lead poisoning doesn’t occur immediately, but comes from the buildup of lead in various soft tissue sites that eventually accumulate to the point of overriding those areas. Sad as it is, most healthy humans have trace amounts of lead in their system that is there but does not interfere with our systems. Continued ingestion or inhalation exposure is what allows it to be built up as we are normally only able to expel around 80% of what was taken in. Chemicals need to be investigated individually as there are a variety of concerns they can fall underneath, depending on the type of organism as well as the organisms life stage. There is no chemical in the world that is perfectly safe for every living thing at every life stage, there is no perfect chemical. So while my examples and statement was a bit too much of a blanket for everything, it was applicable for 2-butoxyethanol which is not an endocrine disruptor, carcinogen, reproductive toxin nor does it mimic anything utilized within the human body. All variables being equal – yes, a drop of hydrochloric acid will burn you. A drop from a gallon of water that contains a drop of hydrochloric acid will not. You can just as easily say a drop of acetic acid will burn you, but a drop of vinegar will not. Please continue to utilize vinegar, I’m merely trying to get the scientific concepts across so that the public can make their own educated decisions. How much do I need to dilute plutonium to make it safe if it just a matter of dilution? There are tiny bits of just about every element in you and around you at all times. You need to understand that just about anything is toxic in high concentrations. I believe the marketing of Simple Green is misleading, perhaps completely innocently. Most people that I have encountered trying to find a “green solution” for cleaning products are looking for alternatives to any chemicals that by themselves are harmful. For instance, Thyme Oil vs Ammonia Chloride. Just an opinion. You scientist can go on batteling out what chemical is what. As long as there is Simple Green I will use it and nothing will change that. This is the best cleaner I have ever used. I have used it for about 20 years now, I am 60 years old and just as healthy as ever. Thankyou so much for a great product. Laura, you say it is highly unlikely to ever reach the PEL of 2-butoxyethanol on 4% mixture. What about if it is mixed with Isopropal Alcohol 20%. to make the dilution 4% butoxyethanol & 20 % Isopropyl . Using 3 bottles a day spray mist, no ventilation. Is it still safe? Also on top of this spraying 70% Isopropyl with the other i just listed. I used Simple Green for the past 6 months. At first it was just unpleasant to use, then after a couple of months, my skin began to get dry and tingly after housecleaning with Simple Green, it took me a while to make the connection and my reaction had to get worse with dry throat and coughing. I got sick 🙂 of it and stopped using it. Right away I was fine. Within a 3 weeks of throwing out the Simple Green my dog turned up with a cancerous tumor, a month later one of my cats suddenly collapsed and died of cancer that the vet said started 2-3 months earlier, now another cat has cancer. I’m feeling freaked out and more than a little worried, Simple Green is the ONLY new thing in my house in 3 years. I’m scared that more of my pets will turn up with cancer, I have no doubt that its from the Simple Green, no matter what they say on the label. I worked on a ship where Simple Green was used. I started developing acute breathing attacks and couldn’t figure out why. I finally connected the breathing problems with weekly cleanings near the air intake system and floor mopping. They stopped used Simple Green and my problems never occurred again. Granted the staff employed a “more is better” policy and probably overused the Simple Green. I had the same problem at a dollar store chain recently. I assumed that it was a sensitivity to perfumes, but I got into a conversation w/one of the employees and she mentioned that they used Simple Green. As I understand after looking on the web there are others who have breathing allergies while using Simple Green. I have never had a problem with vinegar/baking soda. I’m obviously more sensitive than many to this product, but I’m curious to see how many others are sensitive to Simple Green–particularly when used at high concentrations. I realize it shouldn’t be used at high concentrations, but in my experience as a supervisor few employees actual used the correct concentrations (or even read the bottle), which isn’t suprising. How many of us actually read the bottles on anything? Anyways I’ll stick to baking soda and 6% acetic acid (a.k.a household vinegar). safely and how to dispose of it. purpose of this chemical in their product. As you could look up yourself, invertebrates reproduction was disrupted at 100 mg/Liter in aquatic environments, however it was within the EU legal limit to classify it as not toxic to the environment – however every study on animals clearly demonstrates some toxicity. How many not-so-toxic substances can be released until it equals bad news for the planet because they combine their effects and produce even more toxic byproducts? For instance 2-butoxyethenol combines with phosphates in the soil and produces 2-BEP a more toxic chemical. So…while this is an old thread, it points out the long standing pattern of “do gooders” that always think they know more than everyone else, and start up another “bandwagon”, insisting that others “climb on” with them….as this woman did with her own mother. Now, she realizes that she doesn’t know anywhere near as much as she thought she did…just like the weak minded that have allowed the charlatans, like Al Gore, Daryl Hanna, etc, to convince them that, somehow, SUV’s are the cause of “global warming”…no wait!…their data didn’t hold up (it never does, because they lie! )….so they had to change their agenda to “climate change”…that way they can claim either hotter than “usual” summers, OR colder than “usual” winters…OR, vice/versa…a WIN/WIN for the dishonest, big mouthed, do-gooders! While I agree that companies DO need to be watched to prevent fraud and even dangerously illegal products from being sold to the public….of course that doesn’t apply to products made in China, as our dishonest politicians think it is perfectly satisfactory to allow in dangerous toys that kill our kids, or poisonous pet foods that kill our pets….still, I think that when someone…anyone…decides that THEY will be a “voice for the people”…such as the author of this article….everyone needs to listen, evaluate, and then use their own common sense to decide what products they will use in their homes….after all, she was WRONG before…who says she’s RIGHT, now? Simple Green is a very good, and versatile cleaner. Don’t let the socialist crazies in the state of Mexifornia decide for you….if they had their way…we…but NOT they….would all be back in the horse and buggy days.